The journey of Ramrajya starts from Gramrajya and Gramrajya means “Gramvikas” – the pioneering pillar of Shree Aniruddha Bapu’s concept of Ramrajya which was laid down by Him on 6th May 2010. He founded “Aniruddha’s Institute of Gramvikas” (AIGV) at Shree Govidyapeetham, Kothimbe to achieve this goal. Without the upliftment of the rural people, India cannot transform into Ramrajya. Keeping this in mind, Bapu has explained us the importance of Seva coupled with Bhakti and devotion. Although, the main objective of AIGV is to help the farmers who toil in the fields day and night to increase their crop outputs, the focus is mainly to reduce the costs of inputs by achieving home remedies for their personal needs. 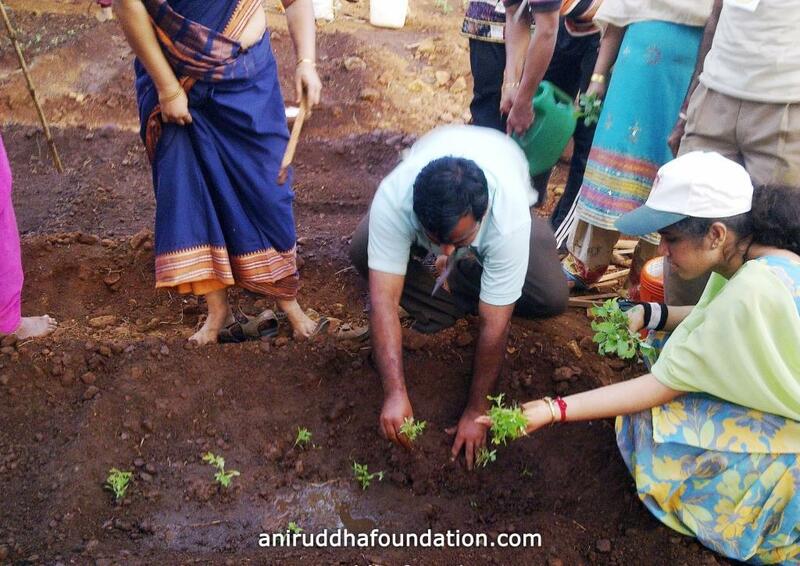 Under the initiative of AIGV many programs were conducted at Govidyapeetham. On an experimental basis, minor goals were set and today you see the way it has excelled step by step by the volunteers. 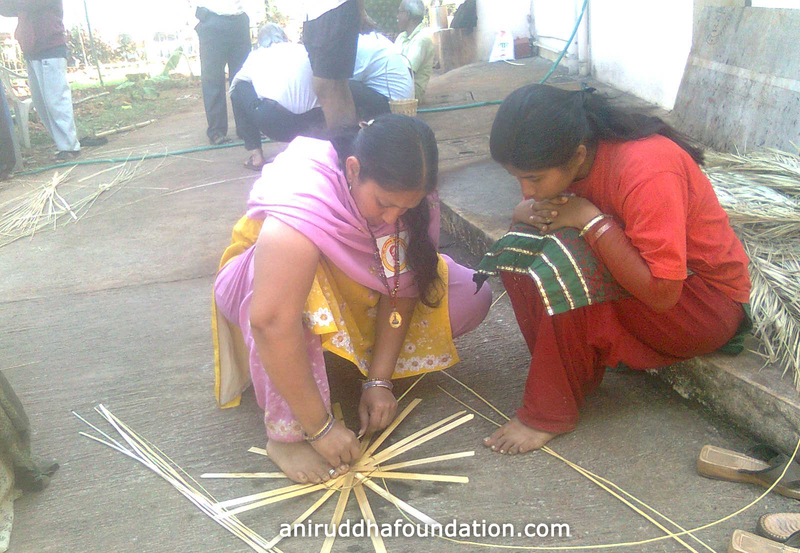 Since 2013, AIGV conducts courses such as ‘Shendriya Sheti‘ (Organic farming) and ‘Pashupalan’ (Animal Husbandry) during the period of eight months i.e. from October to May. This is a residential Diploma course which teaches low cost, non-poisonous, long lasting techniques of farming with the available means and sources. This diploma course has been attended by several shraddhavans from Mumbai, Pune, Sangli, Satara, Kolhapur, Aurangabad etc. regions and they have further implemented the principles of Gramvikas in their surrounding rural areas falling under the respective kendras. Similarly the volunteers have visited certain rural areas and have conducted half day Crash Courses of Paras baug and Gaandul Khatt (Vermicompost). The objective is to execute minor experiments and progress at village level without any opposition. The first and easiest method in ‘Gramvikas’ is ‘Paras Baug’ i.e. Kitchen gardening. This method aims at making use of the available space and the available things at home with the water used during cooking food to farm the different kinds of vegetables according to the season, which can be used regularly. 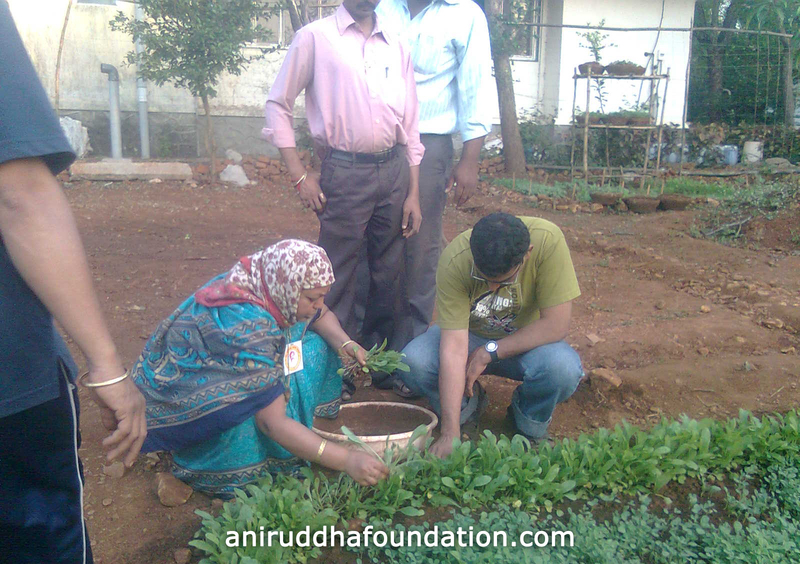 This ‘Paras Baug’ can be farmed in the backyard or the front yard in villages and is prevalent as kitchen garden or terrace garden in city homes. In AIGV the farming is based on the method of Shendriya Sheti (Organic farming). Hence the costing of chemical fertilizers and pesticides is saved. The training of making fertilizers from worm farming, cow farming, and compost fertilizers is organized by AIGV. Also they teach the methods of fermenting Nimark, Dashapaniark, Jeevamrut, Beejamrut. The Azolla project is anchored here which provides fertilizers to the plants and hay, grass to the cows. Useful information of various plants is provided at Vanikarna. Such as plants which convert the dry lands into fertile lands, plants which prevent soil erosion and plants which can help store water by clogging. Under Pashupalan (Animal Husbandry), the breeding of cows, buffalos and goats along with hens, common quail or better known as “bater” and rabbits is taught with demonstrations. This includes all the information right from the cleanliness of their food intakes to animal insurances. Currently, with the help of the latest development of soil-less farming called as Hydroponics science a greenhouse was set up. This greenhouse was set up at minimal costing which provides green and healthy food all year round to the cattle. Here bananas, papayas, watermelons, bottle guards, ginger, turmeric, strawberries etc are produced under Organic farming. AIGV is carrying out its work on the principal of ‘First tried and tested and then taught and preached’. It is a huge success as the basis of it is spirituality. By providing the required information and help for house farming to the struggling farmers, AIGV aims at rural development and curbing the death rate of farmers. Sadguru Shree Aniruddha Bapu will in this way successfully usher a new era of Ramrajya.